The new BMW 2 Series Gran Tourer is available with a choice of five turbocharged petrol and diesel engines, all sourced from BMW’s latest engine family. With either three or four-cylinders, these advanced powerplants offer superb efficiency and, in the case of the 220i and 220d, a 0-62mph time as low as 7.8 seconds. The 220d xDrive is also the only car in its class to team four-wheel drive with seven-seat capability. With the latest EfficientDynamics and ConnectedDrive technologies, the new 2 Series Gran Tourer takes advantage of BMW’s lead in driver safety, energy-saving and connectivity features. And thanks to its typically BMW-like sporting dynamics, it fuses its inherent practicality with genuine driver entertainment, thereby creating a uniquely appealing package. The first premium compact car to offer up to seven seats. 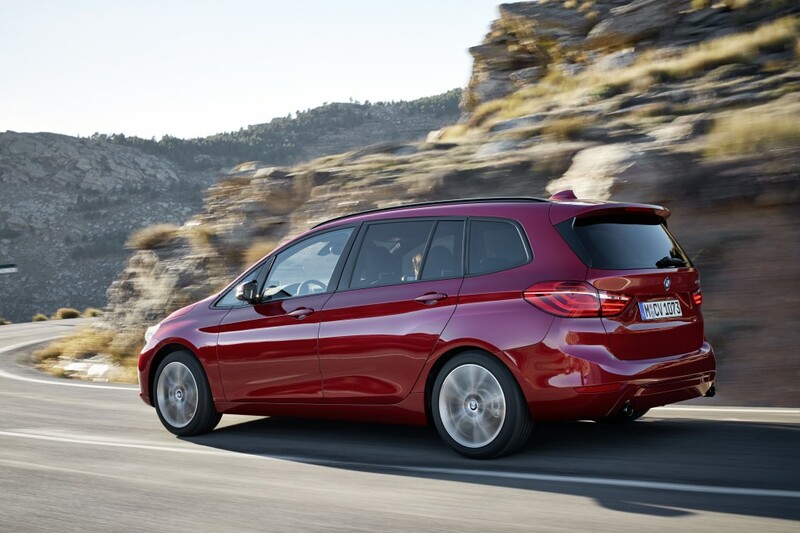 The new BMW 2 Series Gran Tourer possesses compact dimensions of just 4,556mm x 1,800mm x 1,612mm (L x W x H), sharing its advanced front-wheel-drive architecture – including the transversely mounted engines – with the BMW 2 Series Active Tourer. However, it comfortably accommodates up to seven people, while simultaneously offering a generous load compartment that extends and from 560- to 1,820-litres. The Gran Tourer is 214mm longer and 53mm higher than the BMW 2 Series Active Tourer, but a longer wheelbase of 2,780mm provides a further significant increase in space inside the vehicle. The higher roofline allows occupants to sit tall and upright, affording excellent all-round vision, as well as aiding ingress and egress. Legroom, particularly in the rear, is comparable with that of many luxury cars. Three universal child seats can be mounted in the second row, and a further two universal child seats can be fitted in the third row. By sliding the rear seat fore or aft by 130mm, either load capacity or second row knee-room can be prioritised. The backrest can also be adjusted to enhance comfort in the three rear seats or to create extra luggage space. If maximum stowage space is required, the 40:20:40-split rear seat backrest can be remotely unlocked by pressing a button in the boot, then folded down to create an almost level cargo floor. The front passenger backrest can also be lowered to allow long objects such as sports equipment up to 2.60m in length to be transported. Access to the load compartment couldn’t be easier thanks to the large, broad and wide-opening tailgate, which can be opened and closed automatically by push button operation or, optionally, touch-free via a sensor below the rear bumper. Useful features abound in the BMW 2 Series Gran Tourer. There are also lashing points in the load bay and “monorails” on the backrests of the front seats, allowing a folding table to be attached. Much thought has gone into providing numerous storage compartments and space, including room for 1.5-litre bottles in each door panel. Further travel items, such as children’s toys, can be stowed away in the hinged compartments under the front or second row seats. The new BMW 2 Series Gran Tourer comes as standard in the UK with third row seats offering generous space for two additonal passengers. A non-slip step in the rear door opening aids access in conjunction with the folding and sliding second row of seats (Easy Entry). If the extra passenger seats are not required, the third row can be completely lowered into the load area floor to save space. The loading surface remains almost level and the storage space – barring the multifunction tray – remains unchanged. Third row passengers also benefit from a special centre console with two cupholders, a storage compartment and a 12-volt socket. The front of the BMW 2 Series Gran Tourer features a trio of BMW icons – the twin kidney grille, twin round headlights and brand logo. Despite the spacious interior, the front aspect is sporty and flat, with a low windscreen and a high bonnet reducing the perceived height of the vehicle. The bonnet sculpting and the large air intakes sited on the far edges of the nose add to this impression of sportiness. Efficient bi-LED lights are available for the dipped and main beam functions as an option. Within the vehicle’s silhouette – characterised by a long wheelbase and short overhangs – distinctive lines rising towards the rear give the profile a clear wedge shape. The expansive side glazing accentuates the spacious interior, while a high roofline and large doors promise comfortable access to all seats. At the rear, the low loading sill and wide-opening automatic tailgate guarantee comfortable access to the load compartment. The large tail lamps extend far into the side of the car, forming an L-shape with their two LED-fed light banks inclining towards the centre. The interior of the new BMW 2 Series Gran Tourer generates an airy feeling of space, combining a horizontal layering of surfaces and volumes with the hallmark BMW driver-centric design. A high seating position enhances all-round visibility; the visual demarcation between the centre console and the instrument panel actually gives the latter the appearance of floating in midair, while electroplated elements and large trim surfaces with accent strips exude a quality ambience. Five lightweight, powerful and fuel-efficient petrol and diesel engines will be available at launch in the new BMW 2 Series Gran Tourer, all featuring the latest BMW TwinPower Turbo technology with either three or four cylinders. All engines in the range comply with the EU6 exhaust standard. Power is sent to the front wheels via a six-speed manual gearbox; as an option, BMW offers a six-speed Steptronic transmission for the three-cylinder engines, while the four-cylinders motors can be coupled with an eight-speed Steptronic transmission (standard in the BMW 220d xDrive Gran Tourer). All transmissions feature the Auto Start Stop function, which improves fuel economy, while the Steptronic version also offers an efficiency-boosting coasting function. The new engine family is based on an all-aluminium core unit designed for ultra-low friction. The closed-deck crankcase is particularly rigid, while thermally joined cylinder liners with twin-wire, arc-sprayed coating reduce weight as well as friction. A balancer shaft in the three-cylinder engine (or two counter-rotating balancer shafts in the four-cylinder engines) ensures smooth running across the entire rev range. The petrol engines feature turbochargers integrated with the exhaust manifold, with liquid cooling for the manifold as well as the aluminium turbine housing. The exhaust gases cover only a short distance to the turbocharging system, enabling quick responses to the throttle, while the very short warm-up time reduces interior friction in the system and with it fuel consumption. The close-coupled location of the catalytic converter, and the electrically controlled boost pressure control valve – or wastegate – also helps reduce emissions. All petrol and diesel units in the new engine family come with the latest version of BMW TwinPower Turbo technology. The petrol engines feature turbocharging, direct petrol injection, Double-VANOS variable camshaft control and VALVETRONIC fully variable valve control. The technology package for the thermodynamically optimised diesel engines includes turbocharging, variable turbine geometry and common rail direct injection with a maximum pressure of 2,000-bar. These world-leading features have enabled BMW to optimise performance while ensuring high levels of efficiency. Chassis: tuned for agile handling and supreme ride comfort. To optimise the handling of the new 2 Series Gran Tourer, BMW’s engineers focused on a perfectly configured chassis with a wide track, a reduced-friction steering system, a torsionally very stiff and lightweight body, a low centre of gravity and honed aerodynamics. The single-joint spring-strut axle provides the perfect setup for agile cornering performance, with outstanding directional control. Aluminium swivel bearings, the use of high-strength steels in the axle subframe and wishbones and a hollow variable-gauge anti-roll bar reduce unsprung masses, while high-quality mountings and bearings along with precisely calculated elastokinematics ensure fine ride comfort. The rear suspension features a compact multi-link design with particularly stiff control arms and a hollow anti-roll bar. Finally, an electromechanical power steering system provides precise steering and excellent feedback, with both hardware and software tuned for this particular application. The DSC (Dynamic Stability Control) system includes ABS, DTC (Dynamic Traction Control), EDLC (Electronic Differential Lock Control) and Performance Control. In DTC mode the intervention of the stability control is slightly delayed to allow the BMW 2 Series Gran Tourer the appropriate amount of wheel spin for maximum acceleration. In DSC Off mode, precisely controlled brake power is applied at the front wheels to simulate the effect of a mechanical differential lock (EDLC function) for a significant improvement in traction when accelerating out of bends. Performance Control positively influences the vehicle’s self-steering properties by suppressing the typical front-wheel-drive understeer tendency even before a critical level of stability is reached. Standard specification also includes the Start-Off Assistant, Dry Braking function, Brake Standby and Fading Compensation, while ultimate acceleration from rest can be achieved with the aid of the Launch Control that comes as standard in conjunction with the eight-speed Steptronic transmission. The 10-millimetre-lower M Sport suspension that is a feature of the M Sport model is also available as a separate option. It is based on a tauter spring/damper calibration as well as stiffer anti-roll bars. As an alternative, drivers can choose a chassis with Dynamic Damper Control: using the Driving Experience Control switch, two different damping settings are available. In fact, ECO PRO, SPORT and COMFORT modes are available via this switch in front of the centre console. A press of a button calls up a predefined set-up that configures the powertrain and chassis components accordingly.The additional option of variable sport steering allows the BMW 2 Series Gran Tourer to be steered with even greater agility and precision. In the new BMW 2 Series Gran Tourer the ancillary units and electrical items form part of an intelligent energy management system. On-demand operation of the coolant pump, a map-controlled oil pump and Electric Power Steering that consumes energy only when required all contribute to reducing fuel consumption. ECO PRO mode also helps the driver achieve an efficient and frugal driving style without compromising on comfort. This feature enables an improvement in fuel economy of up to 20 per cent, while the coasting function (Steptronic only) and ECO PRO Route (in conjunction with the navigation system) can save yet more fuel. High-tensile and ultra-high-tensile multi-phase steels and components lend the body a high degree of stiffness coupled with extremely low weight. Along with integrating state-of-the-art composite materials, using aluminium helps keep the weight down: the bumper supports, steering shaft, brake guards and wheel swivel bearings are all made of the material. With a drag coefficient of cd = 0.28 the new BMW 2 Series Gran Tourer is exceptionally aerodynamic, thanks in part to the largely smooth-surfaced underbody panelling. The familiar BMW Air Curtain at the front apron creates a curtain of air in front of the wheel arches to reduce turbulence at the front wheels, while the integration of the roof spoiler with the D-pillar trailing edges (aeroblades) optimises rear-end air flow. Trailing edges on the rear lights serve to reduce drag further. Finally, on-demand control of the air flaps behind the BMW kidney grille and in the lower cooling air intake also play their part. In addition to the standard SE version outlined above, the new BMW 2 Series Gran Tourer is available in three other model variants, each with their own particular emphasis: Sport, Luxury and M Sport. Moreover, a host of options are available for enhancing the specification yet further, both inside and out. The new BMW 2 Series Gran Tourer is available in a wide selection of exterior colours, with a multitude of interior trim strips and light-alloy wheels offered. Some 13 different paint finishes are available in all, while the choice of wheels includes nine different designs ranging in size from 16 to 18 inches as an alternative to the 16-inch light-alloy wheels fitted as standard. The extensive standard equipment list includes a high-quality AM/FM radio, with Bluetooth hands-free system and audio streaming in conjunction with compatible smartphones; the iDrive operating system with Controller on the centre console; Intelligent Emergency Call; a 6.5-inch colour display and the Driving Experience Control switch with ECO PRO mode. In addition, every BMW 2 Series Gran Tourer also comes with an electronic parking brake, a front armrest, a rain sensor with automatic headlight activation as well as Collision Warning with City Braking function. Two-zone automatic air conditioning, rear Park Distance Control, front fog lamps and a multi-function steering wheel complete the package. The Sport model brings 17-inch light-alloy wheels, sports seats and bodywork detailing in high-gloss black. The elegance of the Luxury model includes understated chrome trim, interior trim strips in fine wood, exclusive leather upholstery, as well as 17-inch light-alloy wheels. Finally, there is the M Sport model, which maximises the car’s on-road presence via the M Aerodynamics package, BMW Individual High-gloss Shadow Line trim, sports seats in exclusive leather upholstery, M leather multifunction steering wheel and exclusive 18-inch M light-alloy wheels. An attractive range of options includes a panoramic sunroof, Dynamic Damper Control and variable sport steering. There is also the option of a Head-Up Display that projects all readouts from the driver assistance systems, navigation information and the current speed in full colour onto a transparent screen. In addition, the new camera-based Driving Assistant Plus feature additionally includes cruise control with Stop & Go function and a Traffic Jam Assistant. BMW ConnectedDrive offers an unrivalled portfolio of driver assistance systems, with digital services and apps offered either as standard or as optional extras. These include the Collision and Pedestrian Warning with City Braking function, the camera-based cruise control system with Stop & Go function, the Traffic Jam Assistant, Intelligent Emergency Call, Speed Limit Info Memory, the High Beam Assistant, the Lane Departure Warning system and the Parking Assistant. Other services include Real Time Traffic Information (RTTI) and the Concierge Service. To enable apps to be used safely and easily when driving, those offered have been specially tested by BMW to check that they can be used safely in the vehicle with the iDrive operating system and the Control Display. The BMW Accessories range offers a choice of practical, safe solutions for all sorts of tasks and situations. These include bicycle transportation systems, roof boxes, a modular travel system for mounting electronic devices such as smart phones and tablets, and storage bags. BMW offers its own child seat systems for Group 1, 2 and 3, featuring the quality and safety technology associated from the brand. To keep everyone entertained within the new BMW 2 Series Gran Tourer, the BMW Car Hotspot LTE lets passengers connect up to eight devices to the Internet simultaneously. This entry was posted in Car Updates & Releases, Cars, Family Car, Manufacturer News and tagged BMW 2 Series, BMW 2 Series Gran Tourer by David Petherick. Bookmark the permalink.